Recent studies point to a dual role for galectin-3 as both a circulating damage-associated molecular pattern and a cell membrane-associated pattern recognition receptor. 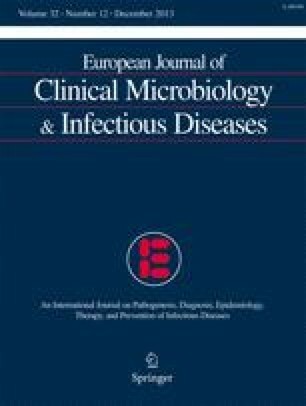 The aim of this study was to assess the potential of circulating galectin-3 for discriminating between infections and non-infectious inflammatory disorders on the one hand, and between fungal and bacterial infections on the other. Galectin-3 and C-reactive protein (CRP) were measured in the plasma of 127 patients with either non-infectious inflammatory disorders (gout, autoinflammatory syndrome or pancreatitis) or an infection (viral lower respiratory tract infection, bacterial sepsis or candidaemia). Circulating galectin-3 concentrations were increased in patients with infections when compared with healthy volunteers or patients with non-infectious inflammatory diseases. At cut-off values with a specificity of 95 %, the sensitivity of galectin-3 (>20.6 ng/ml) to discriminate between an infection and non-infectious inflammation was higher than that of CRP (>156 mg/l): 43 % [95 % confidence interval (CI) 33–53 %] versus 27 % (95 % CI 19–37 %), p = 0.03. After exclusion of patients with CRP <156 mg/l, galectin-3 concentration >20.6 ng/ml could identify 41 % (95 % CI 29–53 %) of the patients with an infection at the cost of one false-positive with non-infectious inflammation. Using this sequential approach, 57 % of the patients with an infection could be selected. Galectin-3 concentrations were similar in patients with bacterial and Candida sepsis, while being lower in viral respiratory infections. Although galectin-3 does not discriminate between bacterial and Candida sepsis, the sequential use of CRP and galectin-3 in distinguishing infectious diseases from non-infectious inflammation may be superior to CRP alone. This study was partly supported by an unrestricted research grant of Institut Mérieux. J.t.O. was supported by the European Regional Development Fund—province of Gelderland project number 2009-010034. M.G.N. was supported by a European Research Council grant (#310372).